The first tenant to move into Winsford Cross shopping centre since the Council bought it has high hopes for the future of the town centre. 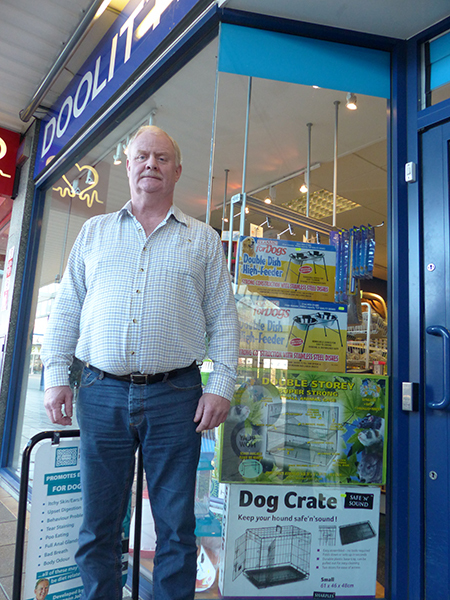 Andrew Crossfield owner of Doolittles Pet Supplies moved into their new shop at Winsford Cross last month and is already seeing the benefits. He said: “We were on Delamere Street before. It was hard for people to get to us and parking was an issue too. We have been trying to get down here for a while and this place came up. We wanted to move here to try and better ourselves and expand our business. We have got the potential to do that now here. Cheshire West and Chester Council plans to improve the town centre after buying the land in February and work is already underway to repair the roof and windows at Winsford Cross. Montagu Evans has been appointed by the Council to help create a long term delivery strategy, which will include improving the infrastructure and unlocking development opportunities to create a revitalised town centre. Andrew added: “It is great that the Council is involved in Winsford Cross. There has been mention of redeveloping and doing the rest of it up which can only be a good thing for everybody. There is a lot of house building going on at the moment so that means more people coming here. “Any help for any business is good. People want variety and that is what gets people to come into shopping centres. If they have got more to look at then they are going to be coming in more often and spending more. People like to park up and have a great choice of shops and then spend the day here, use the local restaurants and are there for the day. “We could also have leisure facilities, especially with them putting up the lifestyle centre. It is all in a self-contained area so it can only improve. Winsford is a small town but, with the planned development of new homes, we want those people to shop in their own town centre.